Premium certified used at BRL Test. Warranty backed by BRL Test's Repair Lab. The Agilent 4395A provides excellent vector network, spectrum, and optional impedance measurements for lab and production applications. Gain, phase, group delay, distortion, spurious, CN, and noise measurements often required for evaluating components and circuits can be measured using one instrument. 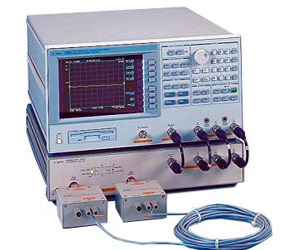 When combined with a test set, the Agilent 4395A provides reflection measurements, such as return loss, SWR, and S parameters. As a vector network analyzer, the Agilent 4395A operates from 10Hz to 500MHz with 1 mHz resolution; and its integrated synthesized source provides -50 to + 15dBm of output power with 0.1 dB resolution. The dynamic magnitude and phase accuracy are +/-0.05dB and +/-0.3deg. so that it can accurately measure gain and group delay flatness, which are becoming more important in modern electronics systems. As a spectrum analyzer, the Agilent 4395A operates from 10 Hz to 500 MHz with resolution bandwidths (RBWs) spanning 1 Hz to 1 MHz in a 1-3-10 steps. A fully-synthesized local oscillator allows stable and accurate frequency analysis. Direct A/D conversion (no LOG amplifier is used) results in +/-0.8 dB level accuracy (@50 MHz, -20 dBm). Noise sidebands fall below -100 dBc/Hz @ 100 kHz offset from carriers, while sensitivity is -145 dBm/Hz at 10 MHz.